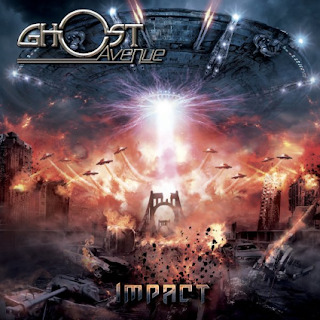 The Norwegian hard rock/melodic metal band of Ghost Avenue strikes back this year with its brand new opus with the title "Impact". As in their previous records, the same here, Ghost Avenue continue to deliver their solid melodic metal/hard rock stuff with the same passion. This time "Impact" is a concept album about an alien invasion on earth and the battle for humanity’s freedom. For those who aren't familiar with Ghost Avenue sound, I would recommend to everyone to take a listen 'cause Ghost Avenue is a really solid band that mixes perfectly the sound of the classic 80's metal with hard rock and along with a more fresh and updated approach creates a strong effort that can't be missed by anyone who loves heavy metal in general. The new record kicks-off with "Impact"!!! This is probably one of the new album's highlights, imho!! Heavy as it gets with a classic metal vibe in it, screaming guitars and powerful vocal lines!! "Prison" and "Time Traveler" are both great melodic metal tracks that 'smells' 80's from miles away. In the Maiden-esque "Dancing With The Devil" is a song that will put a big smile upon the face of every 80's metal freak out there!! It's a track that the band delivers pure melodic metal/hard rock stuff and brings back the glory 80's sound with style!!! Excellent stuff!!! "Construction" is a really nice power-ballad that includes a killer melody in it!!! Killer melodic metal stuff with an 80's vibe in it!!! !